updated 1/ 2019: the geometry is not the Golden Section. It is the square and its diagonal which I have found in many later houses. 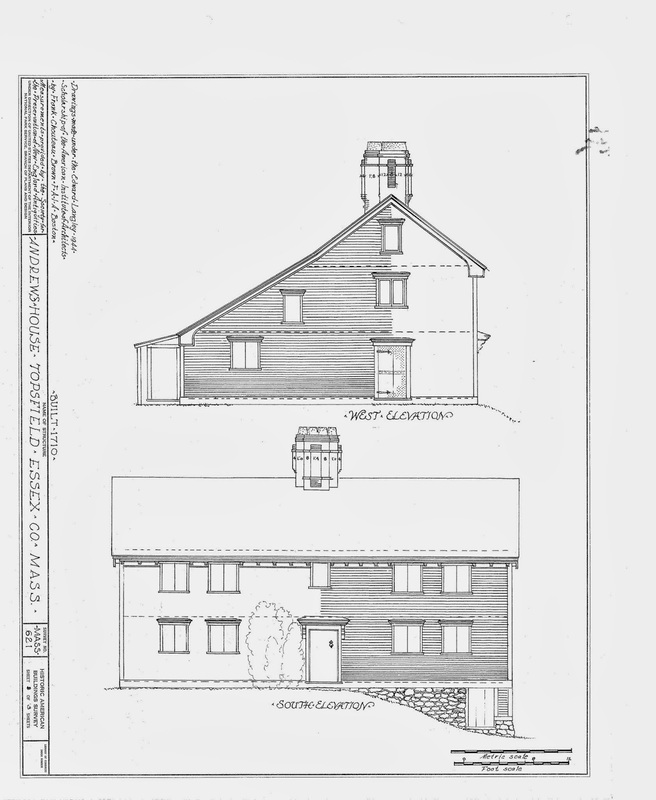 When I was thinking about the original salt box shape of the Locke Tavern, I looked at other early Georgian saltboxes I knew for a comparison. I thought I would find a similar geometry that would reinforce what I had already seen. Instead I found another way to use squares and the circles that fit around them to organize a frame. a website for the French Family includes many pictures and a time line. The French Family site says the house dates to 1675. 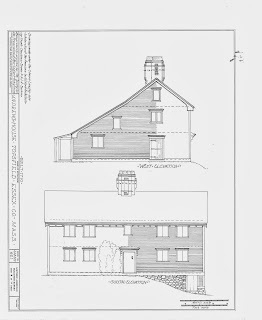 The HABS drawings, done for SPNEA ( now Historic New England) in 1933, say 1710. Abbot Lowell Cummings says 1718. In any case it predates the Locke Tavern, and it was built in the same neighborhood. Here is what I can see about its construction by looking at its geometry. 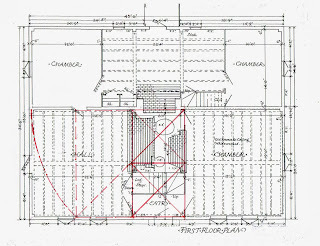 Notes on the drawings for the second floor say at the wall between the lean-to and the upstairs bedrooms: "rear wall old weathered clapboards... balance of wall is shingled". This means the lean-to was added; the exterior siding left in place. I have seen this in other early houses. It is not unusual. It does mean that the front of the house, the chimney, the hall and the chamber were built first. The geometry for the main house is the square and its diagonal. The entry and chimney block consisting of 2 squares (red x's in the center) The corners would be the location of posts and bearing for the summer beams - the beams which are in the center of the rooms. The size of the rooms is determined by the extended square and its diagonal (dotted red line showing the square and the diagonal). The front door is not centered. For a while I thought this might mean one side of the house was built before the other. But then I realized that for the door to swing fully open it had to be off-centered, and that I had seen this layout in other early small houses. You can see in the elevation that the hall window above the front door is also not quite centered - but carefully placed to minimize the asymmetry so that it would not apparent at first glance. Here I have to stop and appreciate the builder who understood how far off from the center of the door and then, from the spot equidistant between the 2nd floor windows he could position the window where it would least call attention to the discrepancy. A fine mind there, one which speaks to me today. He succeeded. Now in January 2019, I am wondering if he framed the wings after the chimney block was determined, as the Parson Capen House seems to have been. This would mean the window geometry came first, the door location last. 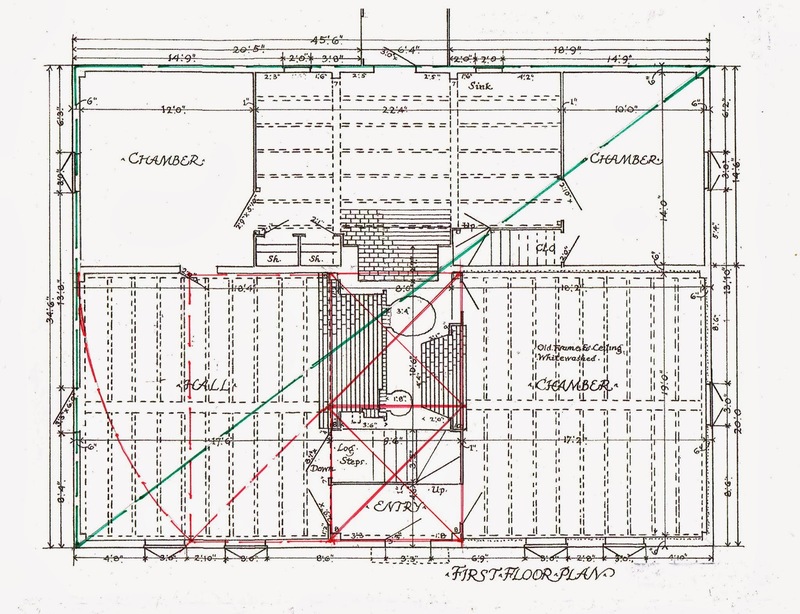 The lean-to dimensions were determined by the 3-4-5 triangle (the green triangle on the plan). This made the framing square to the house - the joists, purlins and sheathing would fit neatly, the house would be tight. 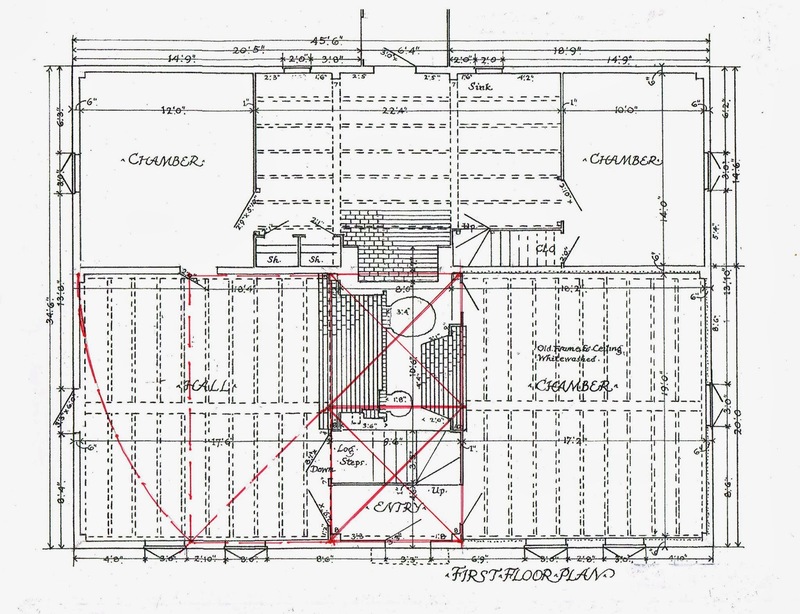 From the drawings we can tell that the width of the house was already 45'-6". The depth of the house became 34'-6". 45.5' divided by 4 is 11.375'. 34.5' divided by 3 is 11.5' . Was the master carpenter 4+" off? Maybe. But I do not know from what place he began his dimensions - the foundation? the outside of the frame? the outside of the sheathing? Perhaps the house shifted in 200+ years between its construction and its measuring, or was re-sheathed. And the measurements might be 4" off.